How MVTR Effects Concrete Floors. What is moisture vapor transmission rate (MVTR) and How does moisture vapor transmission effect concrete floors? Water vapor transmission in concrete floors is simply liquid water that rises through the pores in the concrete by capillary action. Moisture already in the concrete and the sub-base rises as water vapor through the concrete by a process called diffusion. To most people, concrete floors seem dry, very hard, and water tight. The fact is, concrete floors more closely resemble a solid, hard sponge. The inside of the concrete is made up of hundreds of microscopic pores that are filled with water when the concrete is being poured and placed. As the concrete begins to harden, the hydration reaction uses some of the water and as moisture near the surface evaporates the pores dry out. After all the liquid water in a concrete floor is gone, moisture vapor (water) will continue to diffuse through the concrete from the soil if there is no vapor barrier between the concrete and the soil. Without a vapor barrier to block moisture from below, the concrete floor is basically an open "sponge" that can cause problems for coatings, adhesives, and flooring materials. Since there will almost always be moisture in a sub-base below a concrete floor at a higher vapor pressure or higher relative humidity than above the concrete floor, the concrete can never totally dry out. If an impermeable coating or flooring material is installed on top of the concrete floor, the moisture will build up below the coating and eventually cause it to blister and delaminate. Moisture in concrete floors can be a big problem for anyone thinking of installing an epoxy coating, a glued on flooring material, or a concrete overlay. coatings manufactures recommend you wait at least 30 days before installing their flooring materials over new concrete floors. 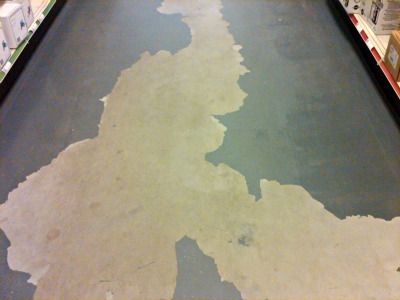 The reason, water vapor transmission from the concrete floor will cause adhesives to soften, will cause coatings to blister and peel, and can cause mildew in carpeting. These problems can be significantly reduced by allowing the concrete to dry out and make sure there is an impermeable barrier between the concrete and the sub-base. The vapor barrier will help prevent moisture in the soil from migrating into the concrete. How do you test the moisture vapor coming up through a concrete floor? What is the best vapor barrier to install under a concrete floor?